This map depicts my attempt at the “Buried Temple” encounter in the old school D&D “Master of Desert Nomads” adventure series (X4). Mapping has become one of my favorite escapes from the drudgery that is graduate school. Whether it’s developing a mystical environment from scratch or recreating a classic adventure, I look forward to spending a few hours playing around with CC3. Lately it’s been the latter, and I’ve found quite a few gems mining my mini-library of TSR adventures. 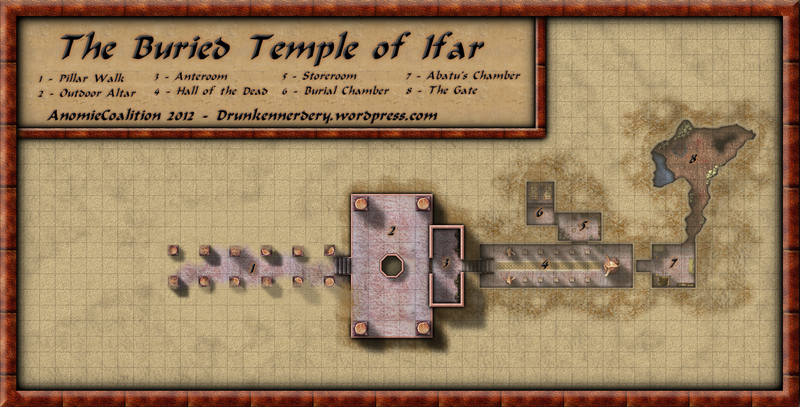 This particular map is a reproduction of a “Buried Temple” encounter in the “Master of the Desert Nomads” module (X4). Our adventures leave the comforts of a desert oasis to investigate a recently unearthed buried temple – Once inside they’ll discover all manner of nefarious creatures, but should they survive, the rewards will be well worth the effort. The most challenging aspect was trying to find a way to depict areas that are both above and below ground on the same map. I spent a great deal of time (and got lots of great suggestions from others on the Profantasy Forums) messing with my underground section. After creating my underground walls, I multipoly’d the area outside the walls and placed that shape on my Background sheet (which sat below my wall sheet on the list). From there I applied a subtle edge fade inner effect so that the sand was slightly covering the wall. I then multipoly’d the area inside my underground wall, applied my sand fill to that shape, and then added a transparency effect to that sheet. My hope was that these two techniques would give the view the impression that this area was underground. After that, it was just a matter of dressing my dungeon utilizing various symbols from the CSUAC and textures from CGTextures.com. I also created a bunch of sand dune sheets (edge fade inner and glow effects) to muddy up the background. I’d be lying if I said that I was completely satisfied with the final product, but I think its human nature to demand more of yourself. I made a lot of mistakes with this map, but I learned even more. ..And I can’t wait for my next opportunity to start the cycle all over again. Categories: Old-School D&D Maps | Tags: CC3, Desert | Permalink.